The SARFAESI Act has been operational for the more than thirteen years. Except for some delaying tactics adopted by borrowers, the law has proved to be very effective which is clear from the fact that 75% of total recovery of NPAs made by Banks and Financial Institutions is by use of the provisions of the SARFAESI Act. The law has been amended by the Amendment Act (44 of 2016) for introducing further reforms as under : removing restrictions on holding controlling interest in the capital of ARCs; permitting investment in security receipts issued by ARCs by noninstitutional investors; exemption of stamp duty on acquisition of financial assets by ARCs from Banks & FIs; inclusion of debenture trustee in the definition of secured creditors; equating lease and hire purchase transactions as equivalent to secured credit; extending system of extending registration of security interest, to all secured creditors, attachment orders issued by any court or any Tax Recovery Officer; making registration effective from the date and time of registration; giving priority to claims of secured interest in the Central Registry over all other claims and taxation dues; and compulsion to register to be withdrawn and registration to be made optional with right of enforcement extended to only registered security interests. Although the SARFAESI Act as amended by the 2016 Amendment Act, is not total adoption of the UNCITRAL Model Law on Secured Transactions, the basic principles underlying the Model law have been adopted in the amended SARFAESI Act. The Seventh Edition of the Book is containing commentary on the amended provisions as well as the consequential modifications made in the Security Interest (Enforcement) Rules, 2002 and Debt Recovery Tribunal (Procedure) Rules, 1993. 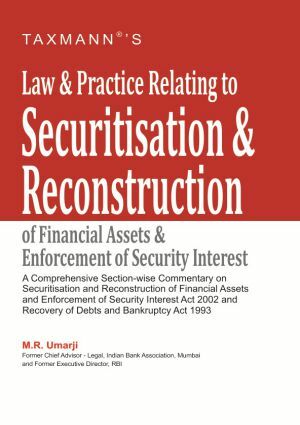 The Book also covers the amendments made in the Recovery of Debts Due to Banks & FIs Act,1993 for the purpose of removing the bottlenecks in the procedure for deciding recovery application and converting the process involving multiple hearings and adjournments into pleadings and evidence to be supported by affidavits and documents relied on thereby facilitating decisions by DRTs considering the pleadings filed by the parties and documents relied on. The recent amendments to RDDB & FI Act, 1993 by the Finance Act, 2017 and the amendments to the Banking Regulation Act, 1949 by the Banking Regulation (Amendment) Ordinance, 2017, are also covered in the Book. I wish to place on record my sincere thanks to Ms Harshada Mahangade Manager, IBA and Ms. Matilda Alvares of International Asset Reconstruction Company for all the secretarial assistance provided to me in completing this edition. I trust the latest edition of the Book will be useful to the Banks, FIs, their borrowers and the legal profession.